Macho B was first documented/photographed in the U.S. in August 1996 by Jack Childs and his hunting party (he was a mt. lion hunter) while exercising his hound dogs in the Baboquivari Mountains of southern Arizona. Six months prior, another lion hunter, Warner Glenn, had photographed a jaguar his hounds bayed in the bootheel of New Mexico. The next year, the jaguar was listed as an Endangered Species thanks to efforts begun by Tony Povilitis and his dedicated students in 1992. The Jaguar Conservation Team was also formed in 1997, placing the responsibility for jaguar conservation with AZ and NM Game and Fish Departments with the USFWS acting as a partner. In 2001, Borderlands Jaguar Detection Project (BJDP) was formed by Jack Childs and his wife thanks to an initial grant from the Wildlife Conservation Society. BJDP worked under a permit issued by the USFWS under the Endangered Species Act (While preparing for my trial as a defendant in Macho B’s case I learned that neither I or McCain were ever placed on this permit). 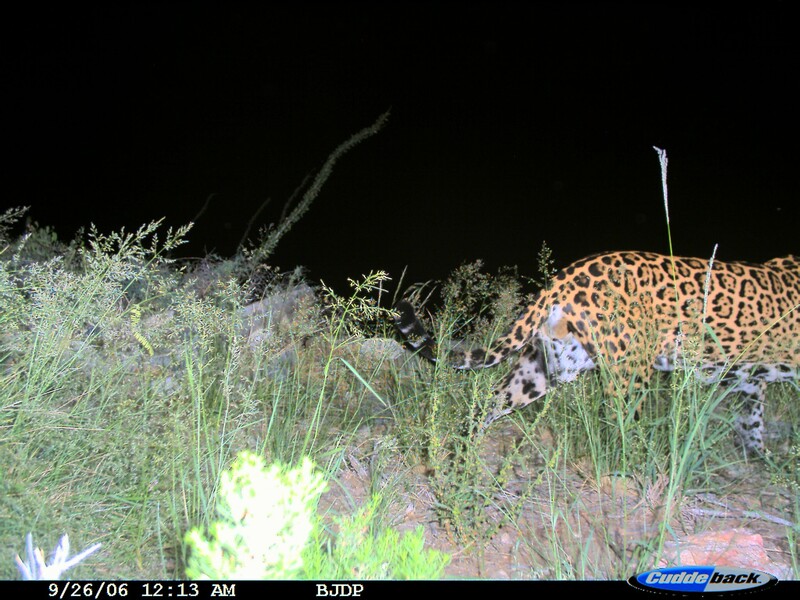 Childs placed about a dozen remote game cameras in a few mountain ranges in southern AZ to monitor for jaguar presence. He obtained his first jaguar photograph in December 2001. This jaguar was named Macho A (Male A in Spanish). Macho A was photographed in the same canyon Macho B would be snared in years later. In 2002 I became a volunteer with BJDP and monitored a camera site with another volunteer. In 2004, Emil McCain was hired as the biologist for BJDP. BJDP was soon considered the research arm of the AZGFD/NMGFD Jaguar Conservation Team. Childs was the chair for their research committee and also served on the Team’s depredation committee and led a work group about the preferred method for capturing and collaring a jaguar (it was with hounds). McCain also served for the Jaguar Conservation Team on their scientific advisory board. Macho B was first photographed by BJDP in August 2004. It wasn’t until two years later when Warner Glenn’s hounds bayed yet another jaguar that spot patterns were compared between Glenn’s latest jaguar photos and photos obtained over the years from BJDP cameras that Childs realized Macho B was the jaguar he met in 1996. Macho A disappeared form BJDP cameras in 2004 after last being photographed with Macho B following his trail just a few hours behind. After Macho A vanished from the project, Macho B remained the only jaguar to be documented by BJDP cameras and personnel until his death in February 2009. Macho B was photographed along the US-MX borderlands over the next few years. When McCain and I began working together in 2006, I was given extra BJDP cameras to place wherever I wanted. I put one of those cameras next to the rock in which I had encountered a jaguar in 1999. Four months later the camera captured the right profile of Macho B, suggesting he was the animal I had met seven years prior! He was, once again, over forty miles north of the US-MX border. Macho B was continuously photographed in this area, including the first images of him spray marking his territory, for the next ten months. Then Macho B did a vanishing act but ultimately resurfaced on BJDP cameras near the AZGFD snaring project in which McCain was now also employed. The first image captured of Macho B far away from the US-MX border.